As November rolls around and Thanksgiving Day approaches, our thoughts start to turn toward family, friends, and holiday get-togethers. This is the time of year to reconnect with what is truly important in your life by cultivating an attitude of gratitude. Being thankful is so beneficial for you personally, as well as for everyone around you. Health: Gratefulness for the little things in life contributes to higher levels of energy and results in a stronger immune system. Heart health and longevity also have been linked to individuals’ states of gratitude. Happiness: Being mindful of all the things you have to be thankful for is a mental health booster and promotes an awareness of well-being. HSN.com up to 5% Rebate New HSN.com customers take $20 off your next purchase over $40 w/ this Coupon Code thru 7/31! Stability: Individuals with an appreciating attitude tend to sleep better and earn higher salaries than their pessimistic counterparts, who are more depressive, envious, and greedy. Relationships: Showing a sense of appreciation for people in your life is key to building strong, loving relationships, and experts say rich relationships are key to a lifetime of well-being. If optimism is not a trait you naturally possess, there are a few things you can do to shift your attitude in a more positive direction. Count Your Blessings, Literally: Start a gratitude journal and list what you are grateful for each day. Think About Others: Every day, reflect on the people who touched your life positively and how you may have or could have reciprocated. Talk Gratefully: Make a conscious effort not to gripe with friends and coworkers. Instead, talk about what you are grateful for and who deserves credit. Choose Your Words Carefully: Avoid negative, derogatory words; speak positively and watch your attitude shift in that direction as well. Mental Subtraction: Instead of complaining about those in your life, imagine your life without them – only for a moment. What would it be like without the blessings of a good partner, children, or a job? This can help boost your feelings of gratitude for what you do indeed have that is positive in your life. Looking at life as mostly full rather than nearly empty is beneficial to us in so many ways. Take a minute to remind yourself of all the things you’re grateful for and maybe even make a few small gestures towards those you appreciate. 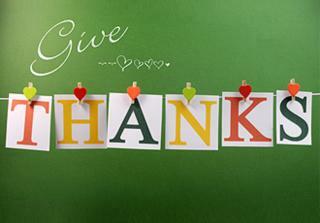 Try to make giving thanks more than a once-a-year event if you truly want to reap its rewards. In keeping with an attitude of gratitude and in appreciation of our loyal readers, RebateBlast is offering Double Cash Back on Pre-Thanksgiving Deals now thru Nov 15. Gobble up these pre-holiday savings and harvest the 2X Cash Back.